* Spread a blanket and lie down on the grass, just looking up at the sky. No telescopes or binoculars are necessary. * You can look anywhere in the sky to see the meteors, but you might see more if you face the east or northeast. * The meteors appear as an unexpected streak of light that shoots across the sky, taking your breath away! * Some meteors are long and bright, others are short and faint. * You can see the meteors best under dark, rural skies, but the Perseids are SO BRIGHT That you can even see some from the big city! * The most meteors can be seen in the early morning hours before sunrise, though you can see a lesser number at any hour of the night. * BE PATIENT!!! You might not see any for a long time, and then you might see three in a row. Spend about 30 minutes to an hour outside looking before giving up! 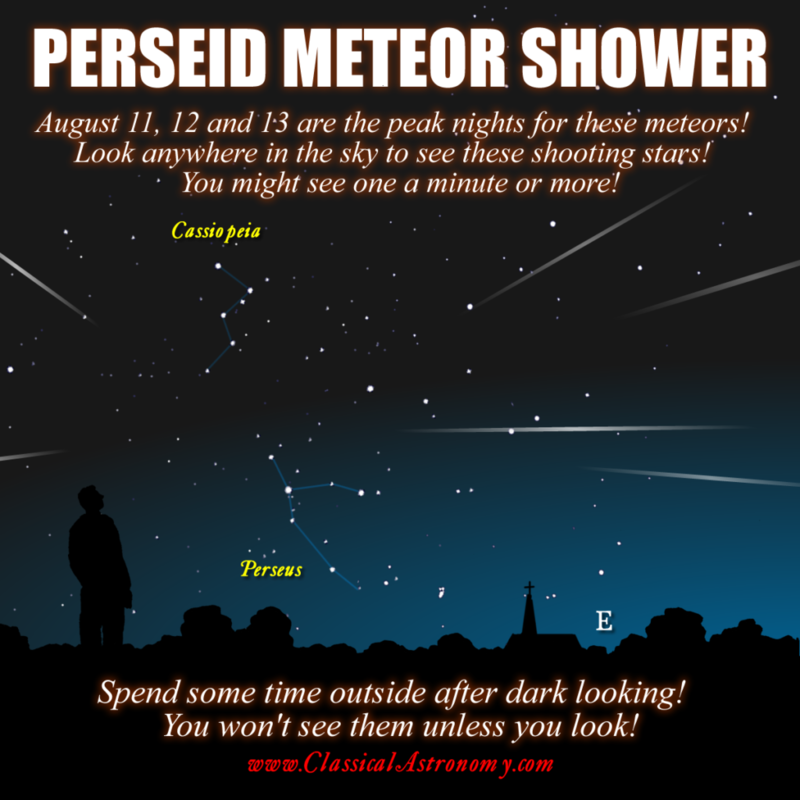 * The Perseid shower continues through about August 24, in case you don’t get to see them on the peak nights. Though there are many meteor showers each year, the Perseids is one of the best, and occurs in the warm month of August. In 2018, the shower occurs near the dark of the Moon so the night skies are not brightened by moonlight. The Perseids radiate from the constellation Perseus, under Cassiopeia, which appears like a “3” or a “W” in the northeastern sky. But these meteors appear in any part of the sky, even though they can be traced back to this direction. Some people think “meteor shower” means a falling rain of shooting stars. It’s not like that. At peak, the Perseid shower delivers as many as 100 per hour. That’s more than one per minute. But don’t be disappointed if you see less. You need to plan to spend some time outside in the hopes of seeing a good handful. But this is time well-spent, and can be a fun family activity! Bring some popcorn and have a family meteor party!